My team at work is moving to Scrum and other teams are starting to do test-driven development using unit tests and user acceptance tests. I like the UATs, but I'm not sold on unit testing for test-driven development or test-driven development in general. It seems like writing tests is extra work, gives people a crutch when they write the real code, and might not be effective very often. I understand how unit tests work and how to write them, but can anyone make the case that it's really a good idea and worth the effort and time? Also, is there anything that makes TDD especially good for Scrum? Long Answer: Unit tests are one of the most important practices I try and influence at my place of work (large bank, fx trading). Yes they are extra work, but it's work that pays back again and again. Automated unit tests not only help you actually execute code you're writing and of course verify your expectations but they also act as a kind of watch dog for future changes that you or someone else might make. Test breakage will result when someone changes the code in undesirable ways. I think the relative value of unit tests declines in correlation with the level of expected change and growth in a code base, but initial verification of what the code does make it worthwhile even where the expected change is low. Unit test value also depends on the cost of defects. If the cost (where cost is loss of time/money/reputation/future effort) of a defect is zero, then the relative value of a test is also zero; however this is almost never the case in a commercial environment. We generally don't hire people anymore who don't routinely create unit tests as part of their work - it's just something we expect, like turning up every day. I've not seen a pure cost benefit analysis of having unit tests (someone feel free to point me to one), however I can say from experience that in a commercial environment, being able to prove code works in a large important system is worthwhile. It also lets me sleep better at night knowing that the code I've written provably works (to a certain level), and if it changes someone will be alerted to any unexpected side effects by a broken build. Test driven development, in my mind is not a testing approach. It's actually a design approach/practice with the output being the working system and a set of unit tests. I'm less religious about this practice as it's a skill that is quite difficult to develop and perfect. Personally if I'm building a system and I don't have a clear idea of how it will work I will employ TDD to help me find my way in the dark. However if I'm applying an existing pattern/solution, I typically won't. In the absence of mathematical proof to you that it makes sense to write unit tests, I encourage you to try it over an extended period and experience the benefits yourself. Errors found earlier is less costly to fix than errors found later. TDD helps you verify the correctness of your system. You invest a little more up-front, but get it back later. The graph is a bit exaggerated , but it shows the idea well. Unit testing has value as a crutch. It supports your development efforts, allowing you to change your implementation without fearing that your application will cease to work as required. Unit tests are also much more than a crutch, as they give you a tool with which you can validate that your implementation matches the requirements. All testing, whether unit tests, acceptance tests, integration tests, and so on, is only as effective as the people using them. If you approach your work sloppily, your tests will be sloppy, and your implementation will have problems. So why bother? You bother testing because you need to prove to yourself and your customers that your software works, and hasn't any problems that could prevent the software from being used. Yes, tests are definitely extra work, but how you go about testing will determine how much effort you will need to put in fixing bugs after release, and how much effort your code will require to change and maintain. TDD, and really any method that requires you to write tests before you code takes the approach that you put in an effort early as a down payment on future technical debt. As you work through the project, anything that gets missed, or is not implemented well will incur more technical debt in the form of increased difficulty of maintenance, which directly affects future costs and resourcing requirements. Testing up front ensures that not only have you made an effort to address future technical debt, but also ensures that you encode your requirements in such a way that they can be verified simply by running your code. Test first also gives you the opportunity to validate your understanding of the problem domain before you commit to solving the problem in code, and it validates your implementation efforts. It really comes down to attempting to maximize the business value of your code. Code that is largely untested and difficult to maintain is generally cheap and fast to create, and very costly to maintain over the lifetime of the product after release. 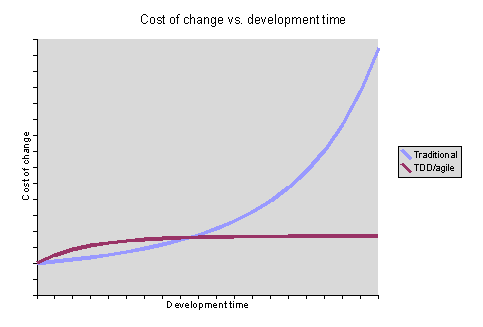 Code that has been tested thoroughly at the unit level is generally more expensive to create, but costs comparatively little to maintain over the lifetime of the product after release. TDD is not specifically good for any particular methodology. It is simply a tool. A practice that you can integrate into your development processes in order to help you to achieve your specific outcomes. So to answer your question, TDD is complimentary to your method, whether it is SCRUM, or any other approach. Is unit testing or test-driven development worth while? For a developer to prove that his code is working better to write a test and pass it than shouting , singing or dancing about it. And since you are not going to delete the test, as long as the test is a pass you are sure that functionality is working - regression issues are solved. You are responsible for making that feature work. Write a test. Just do it. Are SCRUM, Unit testing and TDD related? Shortly, When you are a master at Unit testing you will be near to TDD. SCRUM has nothing to do with this, but as they say, great things mix up well, these techniques of developing a software adds up into an excellent stack, if you have not tried it yet give it a try. Is there anything that makes TDD especially good for SCRUM? As I told above they make a good combination; If you add some automation testing to it, then it is more special. People think it is extra effort because it is an up front activity. What you lose in time now you gain back later on. Gives you a target: You can't write a test if you don't know what the software should do. This helps weed out issues in specifications earlier rather than later. Gives you a sense of progress. Warns you if a code change alters the output of other areas of code. That makes refactoring easier. Provides an additional layer of documentation (especially if you comment your tests properly). Encourages all sorts of good practices. Because tests should run fast, it encourages you to write code that is decoupled and supports mocking. This all aids refactoring. There are others as well covered in other posts in this thread. It is worth it. [Is it] really a good idea and worth the effort and time? No if there is already a lot of existing code that was not developed test-driven and that must be extended (legacy). In my opinion test-driven development is most effective if you write the unit tests before the actual code. this way the code that fulfills the tests becomes clearly separated with a minimum of external references that is easy testable. If the code already exists without the unit tests there it is usually a lot of extra work to write the unit tests afterwards because the code was not written for easy testing. If you do TDD the code automatically is easy testable. Let me approach this from the other side. What happens when you develop a non-trivial application without unit tests? If you have a good QA department, one of the first things that will happen is that you will find that you have a large number of reported issues. Why because you didn't test what you did and assumed it would work and because you didn't pay that much attention to the requirements and your application doesn't meet them. Oops back to the drawing board to rewrite and fix. Now you've made the fixes and find a whole new set of issues because you had no way to verify that your fixes didn't affect anything else before you pushed to QA. Oops deadline has now come and gone and management is upset. Situation is worse if you don't have a good QA department because then the users will find the bugs and not only will that make your boss unhappy, it may bring the production environment to its knees and 100s or even thousands of people will be at a standstill while you fix the bugs that unit testing would have prevented. This is NOT a good career choice. Now suppose this cowboy approach goes on for years? Now every change, even trivial ones, seems to bubble up a new unsuspected problems. Not only that, but many of the things you would like to do to make the application work better, you can't do because they are too risky or too expensive or both. So you put patches on the patches making the system more and more convoluted and buggier and harder to use. Users start questioning your time estimates because they keep getting larger and larger and it's hard to explain to them that the system has become such a complicated mess, it is hard to find where to even make the changes and harder still to make sure they don't break something else. I worked in a place like this where after ten year of development, virtually nothing we wanted to do to fix the real problems could be done because we couldn't tell which of hundreds of customized client applications would break. The initial developers were very much the "unit tests, we don't need no stinking units tests" kind of developers. Everyone who followed them suffered thanks to their short-sightedness. Without unit tests, software is buggier and takes longer both to initially develop and to maintain. Why on earth wouldn't you want to do unit tests? The time you spend writing the test will be far less than the time you would spend fixing issues you should have found earlier (the earlier the bug is found the less time it takes to fix) and issues you would have avoided altogether by writing the tests first which gives a better understanding of the requirements before you start coding. All of the code you write needs to be tested at some point. You don't want to write the whole thing all in one go and then hit the compile button and cross your fingers. You write and compile small blocks and send carefully-crafted input at your code to verify that it does what you think it does. Then, you usually delete your ad-hoc testing apparatus and move on to the next component. With unit testing, it simplifies this process and gives you an excuse to keep your tests around. That way if you make any changes that break the stuff that you'd tested in the past, you can catch that regression explicitly instead of allowing it to affect other parts of your code. There's real value in that. As for the red-green-refactor approach to TDD, I find that a bit tedious. But to each his own. Actually there is one type of testing which I have found is generally accepted and which I believe is ultimately useless. Namely GUI based testing such as by using selenium, webdriver, watir or arquillian. This is how we get the 7 hour build cycles rather than the 5 minute build cycles on my TDD projects. These same devs usually complain with everybody else how bad the code is and how incompetent the previous devs must have been. They also find it extremely important you make a proper design using a whiteboard, MS office or a wiki and take great care to ensure this design remains up-to-date. That last one is what really got me to realise such devs are frauds. We all know any design document which is not a unit test will become outdated and will not be kept up-to-date because of the sheer maintenance cost to do so. In fact I've tried and tried to come up with a good means to express design ideas in MS office format which was useful and legible both before and after the fact of writing code. I failed in all cases and though there are people who manage to produce an MS office document which appears pretty I've never actually found those useful either. So, you have a choice. You can do design and documentation by practicing TDD which is the only known and proven method for producing such documentation based on my 10 years of development experience. Or you can go into politics. Not the answer you're looking for? Browse other questions tagged unit-testing scrum tdd or ask your own question. How much extra time is needed to add unit test in a development task?